AA Batteries are our friends � they can run a flashlight, camera, shaver and handheld GPS. I carry high capacity Nickel-Metal Hydride batteries only. Nothing to throw away, just recharge as needed. I've been thinking about it a bit more since I published the book. I know � I should have been thinking about more important things, but I just love spending time thinking about AA batteries. Right?! Anyway� if all your electrics are running on AA batteries, then you've got a simple system revolving around one type of battery. Instead of carrying replacements for several different battery configurations, you only need to have about four extra AAs in your battery replacement stash to cover outages as they occur. Battery selection is key. Look for high capacity batteries over 2000 mAh (milliamp hours rating). 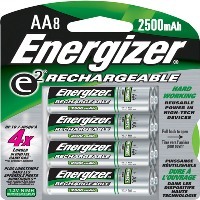 Energizer makes 2500 mAh, Lexmar (if you can find them) come as high as 2700 mAh. 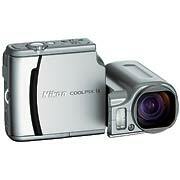 Panasonic is rumored to be releasing a 3000 mAh in 2007, but so far none have hit the market. In my case, the best thing to do was replace all my old NiCads and lower volume NiMH batteries with a dozen high capacity NiMH of the same volume, i.e., 12 Energizer 2500 mAh and a compatible charger. The most frequent outages occur with a handheld GPS and a digital camera. These two items consume more electricity on any given touring day than your flashlight or shaver. I typically go through a pair of batteries every day with my GPS if I run it all day long. If I'm snapping several dozen photos, some with flash, each day, I roll through a pair of AAs about every 3-4 days on the road. If I recharge each night I'm able to keep up with the demand. My GPS of choice � a Garmin 60CSx (shown left). My camera of choice � A Nikon Coolpix S4 (shown right). As for my shaver and flashlight I can pretty much be sure I won't need to do a recharge on either of those battery pairs during the course of several weeks on the road. Shaving one to two times daily over a two week period never required a recharge. My flashlight configuration is so frugal it only needs a recharge about once a year. My shaver of choice � the Braun Pocket Go 370 (shown right). Cost is about $20. Not the world's best shave, but it's enough to get me by on the road. If I need to do a second round in the evening I'm more than happy to considering the agility of carrying a shaver like this over one that I have to plug in. It can't accidentally turn on by itself in your luggage because of its unique case design which requires you make a 180 degree turn of the case before you can power it up. My flashlight of choice � a AA Mag Lite using a NiteIze LED bulb conversion (seen at left), a Nite Ize IQ switch and a Nite Ize flash light headband. Simply replace the original bulb with the LED and install the IQ switch onto the back. The LED bulb gives you about 7 times more duration than the stock halogen and is just as bright for close range work such as setting up your tent and getting to the restroom at the campground. The IQ switch has five settings. 100%, 50% and 25% power as well as a fast and slow flash setting which might come in handy sometime in the event you need to signal a little help out on the highway or let those search and rescue helicopters find you in the dark. Energizer 2500 mAh Batteries and Charger � Available in the Sound RIDER! store . 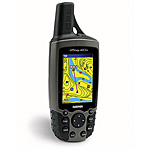 Garmin 60Csx GPS � Available from the Sound RIDER! store . Nikon S4 Camera � See the Nikon website for local dealers and online specials. Mag Lite and Nite Ize Accessories � Available from the Sound RIDER! store . 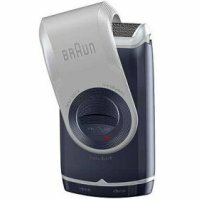 Braun Pocket Go 370 Shaver � Available from the Sound RIDER! store and better department store chains. 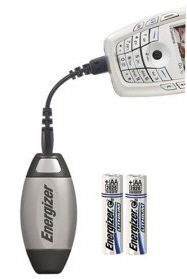 Energizer Energi To Go Cell Phone, PDA, MP3 chargers - Available from the Sound RIDER! store and better drug stores. But wait a minute. Let's suppose we forget to recharge our spares one night. Tough luck the next day? Probably not. There are two solutions in play here. The first is to carry a one-hour charger with you. With NiMH batteries they won't develop memory loss in a high speed charger the way old Nickel Cadmiums did, so don't worry about harming the batteries performance in a one-hour charger. With a one-hour charger you can go get breakfast and charge while you eat in the morning or maybe during your lunch stop that day. When selecting chargers you must be certain they will accommodate whatever capacity your batteries will charge to. For instance, don't take along a charger that will stop after it puts 1100 milliamp hours (mAh) when you're carrying 2500 mAh batteries. The other backup you have is your shaver or flashlight. Chances are you've got a pretty good charge left in those devices to cover the bases in your GPS or camera until you get to the next point where you can charge them all. Three items you'll almost never find with AA battery options are cell phones, PDAs and music players. But you're not out of luck here. You can get adapters that will allow you to charge a cell phone, PDA or MP3 player from two AA batteries. Available again from your local drug chain store, this time for about $20, chargers like the Energizer Energi to Go systems do both mini USB connectivity as well as a variety of cell phones on the market today. Finally if you do have lesser capacity NiMH batteries you're looking to replace, there's no need to chuck them just yet. They work fine in low wattage applications such as TV remotes, wireless mouse and keyboard units and running other LED flashlights at home (don't we all have three more Mag Lites in the drawer? ).